Getting your car paint protected in Singapore is both decorative and functional. Car paint protection protects your investment and sustains its value. It saves car owners money in the long run, extends the life of your car, retains its shine and reduces the need for polishing and makes washing easier. What are the types of car paint protection available? Waxing creates a barrier between your car paint and the immediate environment, offering protection from possible damages. Waxing can make the surface of your car hydrophobic, letting rainwater and splashes from the roads to run off your bodywork. However, wax builds up over time and creates layers, making your car prone to scratches and defects. Therefore, it needs regular polishing to maintain your car’s shine. Glass coating also eliminates the need for sealants and waxing. Glass coating is the use of a pure, clear liquid to provide gloss, durable shine and protection on your car’s paint. Glass coating can be done on the car’s glass, paint and wheels. It prevents oxidation, resists scratches and offers your car’s paint a high gloss, mirror-like shine. Your car is first washed and dried, clay bar is then applied followed by compound. Glass coating application is done last. A microfiber cloth is used to apply the glass coating in small areas until the whole car is protected. Glass coating is expensive and complex to apply, and does not last long. Nano ceramic is a liquid polymer that chemically bonds with your car’s paint, adding a protective layer. It doesn’t replace your car’s paint protection film, but works as a premium alternative to waxing. Ceramic coating creates a semi-permanent or permanent chemical bond with your car paint, making it a durable form of paint protection. It keeps your car looking as good as new with minimal maintenance. What is the best type of recommended car paint protection? Unlike waxing and glass coating, nano ceramic coating is a stronger, protective car layer that is more durable. Even though more costly at the start, the advanced technology invested in ceramic coating can last you longer than waxing and glass coating, saving you money in the long turn. The paint protection improves your car clear coat and paint’s reflective properties, giving it enhanced gloss. It also makes your car hydrophobic and thus easier to clean. It’s also cost-effective, eliminates the need for car wax and keeps your car cleaner for longer. Hence, nano ceramic coating is one of the highly recommended car paint protection type due to low maintenance. 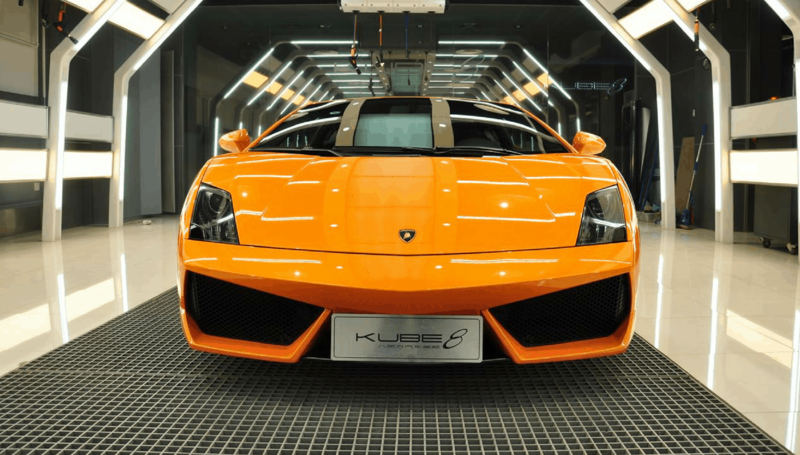 Do you need car paint protection for your car? Car paint protection for your new car is worth it when the service is performed by a specialist or reputable car dealer. If used properly, paint protection can protect your car from scratches and give it a glossy shine. We recommend car paint protection only for new cars or within a year after purchase to protect the color of your car. Otherwise, your car would need professional paint correction and car detailing to restore your car’s new look. It can’t prevent scrapes, scratches and stone chips often caused by driving, from the surface of your car. Your dealer’s branded product doesn’t guarantee better results than or similar quality to market leaders. Your dealer doesn’t have experienced car care professionals to work on your car. Contact us to find out more about our car paint protection services and how we can give your new car an added protective layer for increased value. At New Age Polish, we used the brand Kubebond as our nano ceramic coating. CHOOSE NanoTech, Kubebond’s parent company, has developed multiple coating solutions to address diversified industrial applications and customers’ needs. The main goal is to use advanced technology provide perfect protection to our customer’s car. Similar to a diamond, 9H ceramic coating is the latest revolutionary product that creates a superior layer on surfaces to keep them strong and shiny. Also known as “Liquid Ceramic”, our 9H ceramic coating simply transforms from a transparent liquid to a transparent 9H pencil-hardness ceramic film when applied on surfaces. The ceramic barrier seals the underlying surface against contact with the environment and provides hydrophobic properties, scratch resistance, anti-stain functionality and acid/alkaline resistance. The KubeBond series of coatings not only passed a series of stringent quality control tests, but are also SGS certified. UV aging test, thermal shock aging test and humidity aging test are used to assess our coating product to ensure the quality over a long period of time. Through UV degradation testing via specialised equipment, we are able to simulate years of UV and water damage on outdoor objects in weeks or even days. These damages include: discolouration, colour change, loss of gloss, powderisation, cracks, blurriness, embrittlement, loss of structural integrity and oxidation. Diamond 9H is similar to water due to its clear and transparent nature. The product is in its liquid form in a bottle but after application cures into a hard, rigid film like glass to protect the substrate permanently. The Diamond 9H has been through the pencil hardness test, a relative concept with hardness ranging from 1H to 9H, the latter being the hardest. Most global car care coating products do not have a real thickness and hardness. The Diamond 9H hardness test result was 9H, using JIS5400 testing regulations, certified by SGS. Our high definition optical lenses measure and calculate the surface tension, CMC, pendant drop contour, Gibbs free energy and the contact angle of different liquids on different material such as bulk materials, fibre material, and fabrics. This equipment helps us to develop a KubeBond product series that has exceptional hydrophobic performance. This superior hydrophobic effect allows for water to bead up on treated surfaces and, with just a slight tilt, the droplets will slide off the surface achieving the self-cleaning effect and carrying dirt and harmful contaminants away with it. With Kubebond’s exceptional hydrophobic performance, dirty water stains from rain or splashes from the road will easily slide off your car’s paint instead of staining it. The Pencil Hardness Test has proven that Kubebond’s products are 9H, the hardest glass-like rigid firm, causing it to be extremely durable and long lasting as compared to typical wax and glass coating. Long lasting product also meant that you don’t have to wax and coat it as often anymore. Ceramic nano paint protection is known for having the lowest maintenance effort and costs in the long run. The environmental factors will not be a treat to your car anymore. Acidic bird dropping and sap from trees can be easily removed because your car is now protected with Kubebond’s ceramic coating! Get in touch with our car paint protection specialist to have a free consultation on how we can help you protect your car. No obligations at all! Grabiel took his time to explain and demo on the products they use for car glooming. I did a ceramic coating and interior glooming on my 3 years old car looks so fantastic. I was shock at first by the outlook of my car now looks like a brand new 1st hand car. The result is indeed worth the money spent. During the grooming process he keep me update with picture and video of before and after result. Attention to all the car lovers this is definitely the right place to pamper your car. Hmm.. enough said to see is to believe. I am looking forward to the 1st car wash service by them. Thank you Gabriel and team for the effort and handwork your guys put into my car. They were very professional. During the inquiry process, Mike was extremely patient in explaining the process and perks of the ceramic coating. When the car was finally in the shop, he provided a stage by stage update over whatsapp (with pictures). Gabriel, the owner, was also thoroughly hands-on. He was personable and ensured an added assurance that the workmanship would be top notch! If you enjoy quality service and workmanship, New Age is definitely a place worth considering. This is definitely one good place to go and pamper your car. The dedication and professionalism displayed by Gabriel and his very competent team of specialists is worth our two thumbs up. As recommended by Gabriel, I did my first car wash back at New Age today after my coating done a couple of days back. I guess the shine on my car has doubled or tripled. I have heard many good reviews of New Age and Gabriel, and indeed I would say great job done man. Go have your coat done too if you haven’t, and I bet you would resonate my views. Thanks, New Age, for redefining car beauty to another level!